The Chaîne des Rôtisseurs. I thought as in those days people cooked on open fires with the use of a rotisserie, spit as we know it. The goose also relates back to three thousand years bc, with the Egyptians, it was big on the menu especially foie gras. This technique was used and travelled around and landed up in the Mediterranean. The French took it as their own. In our studies and food history we study French cookery. So I thought we should marry the two. A logo with a goose on the spit, our designer came up with a very abstract logo as is now our new logo. Craig has been in the restaurant industry for the past 30 years, and has worked at most of the Cape’s top 5 star properties, heading places like Ellerman House and Cape Grace, where they won the best small hotel in the world. 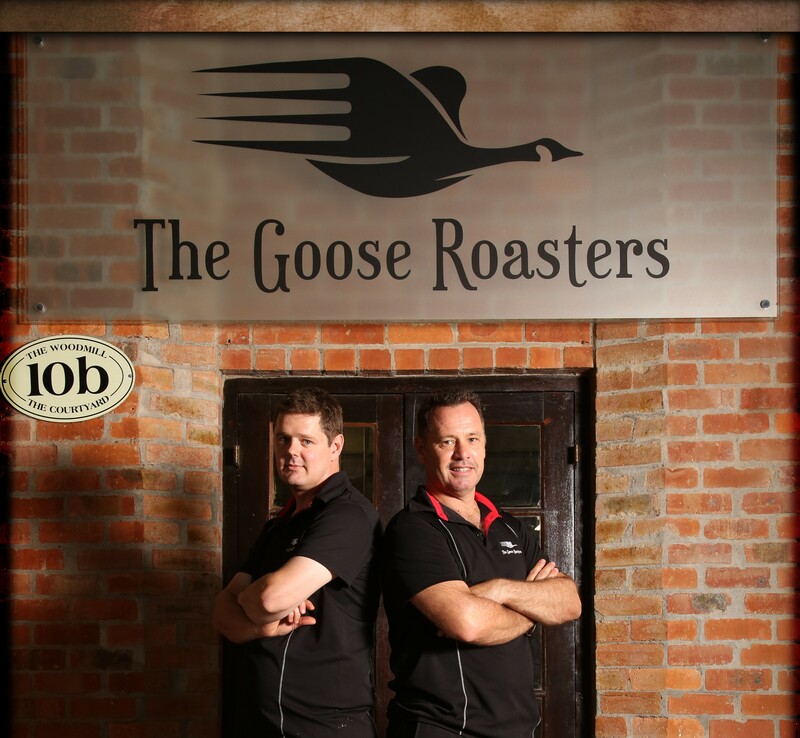 He opened his own business with Bertus Basson in 2005, the business expanded into Overture restaurant, The Goose Roasters, Die Worsrol, Bertus Basson signature foods, and Amoleh salt. He is very involved in the industry, was previously Chairman of SACA for 2 years and is currently the vice counsilier culinaire for the Chaîne des Rôtisseurs Bailliage du Cap. He is also on the board of directors of the Culinary Academy. He has travelled abroad many times, working in Mauritius, Turkey, Greece and the UK representing South Africa at various food promotions. Beau started off his career working with Craig Cormack and Bertus Basson during his studies. He has gained significant experience in a lot of different cuisines, but none more so than Thai cuisine. He worked at the only authentic Thai restaurant with a Michelin star, Nahm. This is way we tend to have a lot of Asian influence in our cooking. He also worked at Overture and was Head chef of a Eat Out Top 10 restaurant two years running. During his time there he took part in the Chaine de Rottiseur jeunnes commis or Junior chef of the year competition. He won the Western Cape competition and placed 3rd in South Africa. Beau was Executive chef at Arusha Coffee Lodge in Tanzania, and in his 2nd year with them they were voted in the top 20 Lodges in Africa and the Middle East. In 2014 his started his own line of preserves and sauces, called “Beau’s handmade original”, two of the preserves are currently in checkers with the cheese company Kasselshoop. We operate in the Stellenbosch area from a kitchen specially designed to do catering functions from 2 guests to 1000 guests. We cover any area for catering, Northern Suburbs, Southern Suburbs, Cape winelands, Helderberg, Overberg, Stellenbosch, we have affiliate companies that we work with in Johannesburg, and once a year we go to the Norther Cape, Garies and Kamieskroon to set up a kitchen for the flower season. The Woodmill lifestyle centre just outside Stellenbosch premises are open from Monday to Friday 9am to 5pm for light meals, we run a small menu with coffees and soft drinks. We us this space to cater for the business park as well as our catering wing which is for both businesses, private and corporate. We cater 7 days a week. for breakfast, lunches and dinner’s catering to our client’s needs. We are also offering a daily menu of prepared food items for the businesses in the centre. These menu items can be enjoyed as a sit-down meal or as a take-away option. Take-away for home dinner meals are also available, please place your order with Kelly-Anne at the shop.